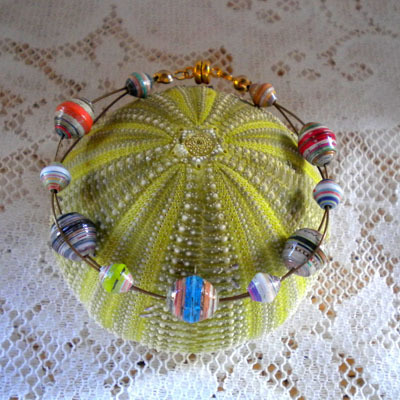 This type of design is very simple way to display both the paper beads and the exposed soft flex beading wire. The paper beads almost look like the different planets in orbit with the colorful swirls of paper beads around each bead. This particular design is the perfect example of how to best use different size paper beads, mostly round and olive shaped beads. Hmmm… this would look pretty in a three strand necklace, what do you think? I watched the tutorial- where do you get the crimp beads? 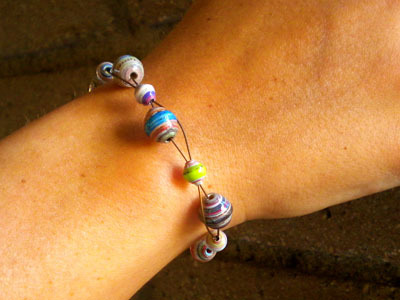 I think this would be great to do for the paper bead trade, very simple and pretty, too. I really like this too.I also like that the only accent is the wire and the magnetic closure. Very simple and beautiful. 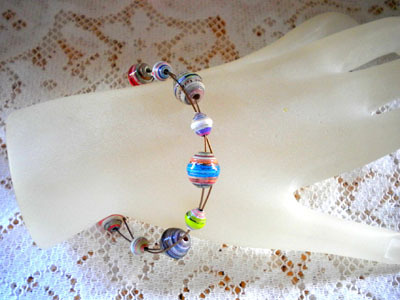 I like you can use different size beads with this bracelet. I would like to do this one for the bead swap too! I Love It! I think it would look great in a 3 strand necklace! I really love this bracelet ! I think I should do one like this with the beads from the swap !